After a long and successful run, we reluctantly bring production of the TEF20 analyzer to a close. The new TEF25 provides greater range and bandwidth and allows for faster processing through its' computer interface. The TEF25 utilizes state of the art components with the ability to expand and grow to meet the demands of the future. We will continue to support, repair and calibrate existing TEF20 units, but our efforts are now concentrated on the continuing sales and development of the TEF25 and its' associated software. 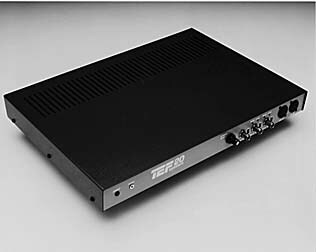 TEF 20 has two line-level inputs on the front panel. Either input can be selected from software. TEF 20 has two microphone-level inputs on the front panel. Either input can be selected from software. Connector Three-pin XLR, pin 2 "+", pin 3 "-". Interface, serial One RS-232 serial port, capable of operating at 57.6 kilobaud. Must be assigned as COM1 or COM2. Interface, parallel One bidirectional 8-bit parallel port. Must be assigned as LPT1 or LPT2. The trademark SOUND LAB is licensed under United States Trademark Registration No. 1,424,678 and 1,732,027.